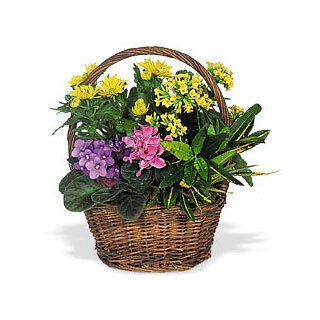 When this grand basket of assorted seasonal flowers arrives, it is sure to make an impression! Small groups of bright, festive flowers sit atop assorted greenery, giving this assortment the natural look that is so popular right now. With flowers grouped in ascending height, this arrangement seems to fill the room with natural beauty. This is the perfect choice to send a business associate or a loved one. PLEASE NOTE: The flowers in the basket may vary depending on availability.